Dad Gum! 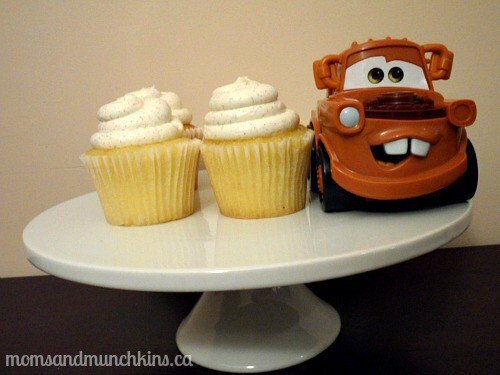 Everyone loves Lightning McQueen’s buddy Tow Mater so it’s no surprise that this lovable character is such a popular theme for birthday parties. 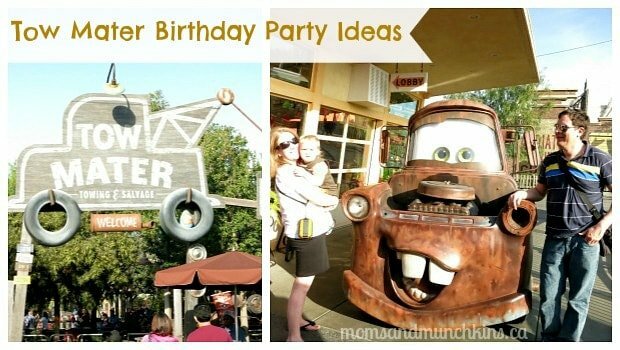 In this post, I’ll share ideas with you on invitations, decorations, food, activities and favors along with links to where you can find Mater birthday party supplies. 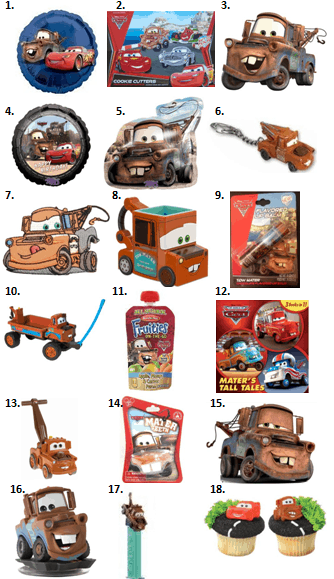 Tow Mater owns a towing & salvage yard so your party invitations could incorporate some of these items. For example, an old and washed out can could be used for a party invitation! A sized invitation could be glued on the outside of the can and the can could be filled with candy. This invitation would have to be hand-delivered. Other fun & homemade ideas include a paper invitation that resembles a spare tire, a silhouette of a tow truck or even a simple orange cut-out resembling a safety cone. We had the pleasure of visiting Cars Land in Disney’s California Adventure Park a couple of months ago (you can read that full post here). This is a must-see if you are ever in the area! Walking through Cars Land is just like walking down the streets of Radiator Springs. We even had the chance to meet Tow Mater and Lightning McQueen in person! My little guy was so excited about that. 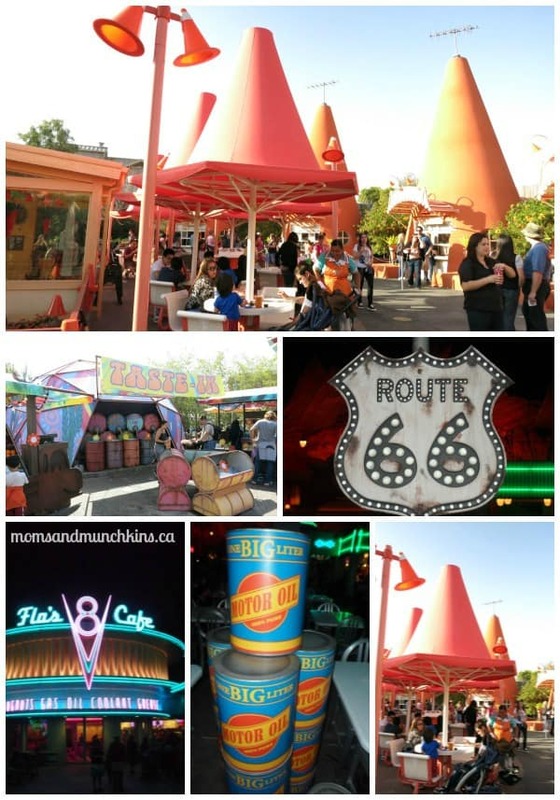 Radiator Springs provides plenty of party planning inspiration. With so many great shops, landmarks and characters in the Cars movies, there are so many ways you can decorate for your Mater birthday party. Towing & Salvage: Mater is proud of his towing & salvage business so a fun idea is to try to recreate some of this for the party decor. This could include old tires (or inflatable ones), unused and clean gas cans and random auto parts that don’t pose a safety issue for the little ones. Route 66: Radiator Springs is located on Route 66 so a cute idea would be to include a Route 66 highway sign and perhaps some highway lines. Cozy Cone Motel: Safety cones and mini Cars figurines could be placed in a play area for the kids and labeled as the Cozy Cone Motel. Luigi’s Casa Della Tires: Inflatable tires could be hung on the wall to look like a mini tire store. Desert & Red Rock: When picturing Radiator Springs, you can’t forget all the beautiful red rock and desert scenery. This can be incorporated through little decor pieces like mini cactus plants. There is also Flo’s V8 Cafe and Fillmore’s Taste-In but I’ll talk about each of these a little more in the food section. Heavy Metal Mater: In this cartoon, Mater recalls the time that he was a famous rock star. You could create your own little “garage band” by setting up some fun karaoke in your garage. Rescue Squad Mater: In this cartoon, Mater recalls the time that he was a rescue firetruck. This could be turned into a fun game using water balloons to knock out imaginary fires. Mater the Greater: In this short cartoon, Mater recalls the time he was a daredevil. This could be turned into a fun jumping competition where guests have to try to jump over a “canyon” (from one mat to another without falling in the water/blue tissue paper beneath). After each round, the mats could get further apart. El Materdor: In this short cartoon, Mater recalls the time that he was a bull fighter. This could be turned into a fun game of tag where one person carries a red flag and the rest of the guests (the “bulls”) try to tag him. Tokyo Mater: In this short cartoon, Mater turns into a modified import vehicle. This could be turned into a fun craft activity where the guests take a large box and turn it into a cool vehicle. Unidentified Flying Mater: In this short cartoon, Mater meets a UFO and teaches him more about life on Earth. This could be turned into a fun game of flying discs (Frisbee). Monster Truck Mater: In this short cartoon, Mater recalls the time we was a famous monster truck wrestler. This could be turned into a fun wrestling game where guests tackle balloons. Another fun idea to test your strength is a tug of war competition between the kids. Moon Mater: In this short cartoon, Mater makes a trip to the moon to rescue a fellow “autonaut”. This could be turned into a fun towing obstacle course. One guest could sit on a skateboard while another guest “tows” him through an obstacle course of safety cones (moon rocks) and over small ramps. The team with the fastest time could win a prize. Mater Private Eye: In this short cartoon, Mater uses his Private Eye skills to solve a mystery. This could be turned into a fun mystery solving game at home – here are ideas for creating some clues. Air Mater: In this short cartoon, Mater shows the audience his best flying skills. This could be turned into a simple paper airplane building activity and competition for the furthest flying distance. Time Travel Mater: This is my favorite of Mater’s Tall Tales! In this short cartoon, Mater goes back in time to make sure Stanley & Lizzie meet and that the town of Radiator Springs is created. This could turn into a fun game of building a town out of cardboard boxes, markers, strong tape and other supplies. In Cars Land, there is a delicious snack area by the Cozy Corner Motel. Here you can enjoy delicious snacks – many of them in edible cone shapes! This could be incorporated into your party with safety cone drinking cups (yes, there really is such a thing! ), popcorn in cones, fries in paper cones, “cone dogs” (corn dogs), snow cones, etc. One of the most known landmarks in Radiator Springs is Flo’s V8 Cafe. Your party cafe could serve pop labeled as “motor oil” and some classics typically served in a small town cafe like fries, gravy, sandwiches and homemade pies (these pies could be in a mini tart version). Don’t forget about the groovy Fillmore’s Taste-In for a drink bar that could feature colorful frozen slushy drinks in groovy cups with a tie-dyed look. There are even punch dispensers made to look like gas pumps! I’ll have a link to these below. My absolute favorite idea for party favors for a Mater birthday party are the signature Mater buckteeth! 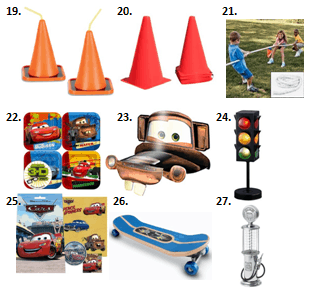 There are also many variety of small Cars figurines, Cars snack bags and Mater party hats. You’ll find plenty of additional ideas for favors, decorations and more in the photos below. I hope you have a Dad Gum good time at the Mater Birthday Party! For more creative party ideas, follow Moms & Munchkins on Facebook, Twitter, Pinterest and Bloglovin’.